Another month, another “escapada”. 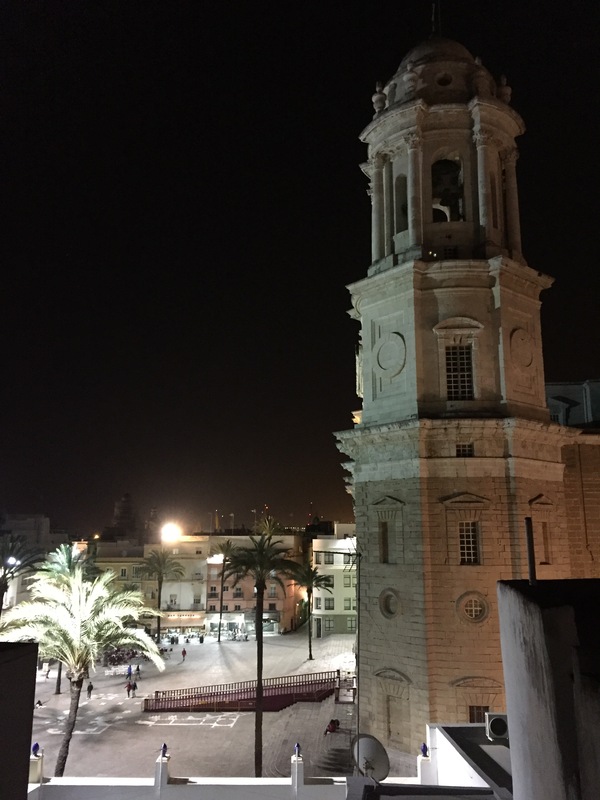 This time to Cádiz, a city I had overlooked for far too long. Three nights in probably the best-located Airbnb flat anywhere, with a terrace looking directly onto the tower of the impressive cathedral. It was the flat of Francesca and Carlos – for me the real benefit of the Airbnb system is being able to stay with locals and get their tips about things to see and places to eat. Day one breakfast was at La Bodeguita de Plocia, Francesca’s recommendation, a short walk from her flat towards the port. Eight of us at a big shared table. Me, one elderly Spanish woman, and six Guardia Civil. That was an interesting conversation! One of the police put his gun on the table between us, which had the effect of slightly putting me off my tostada. 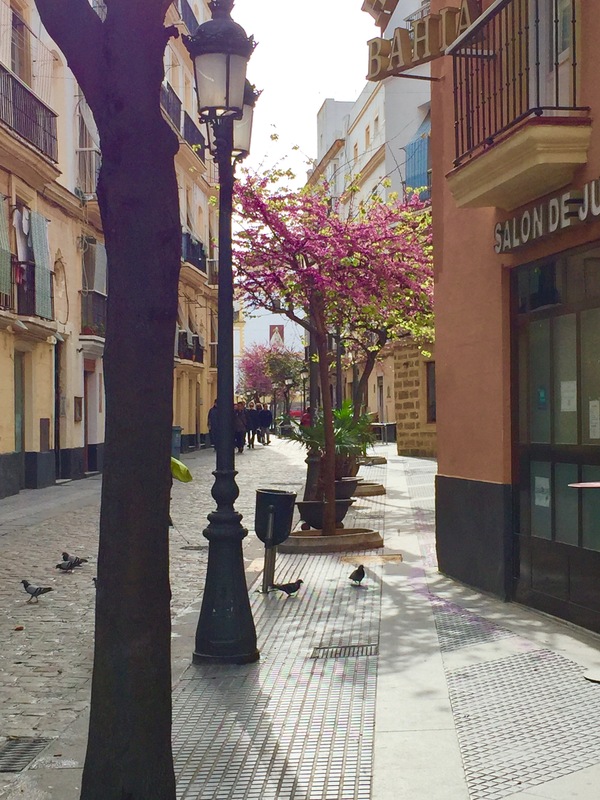 I like Cádiz – that first experience of strangers chatting together over breakfast turned out not to be a one-off event. 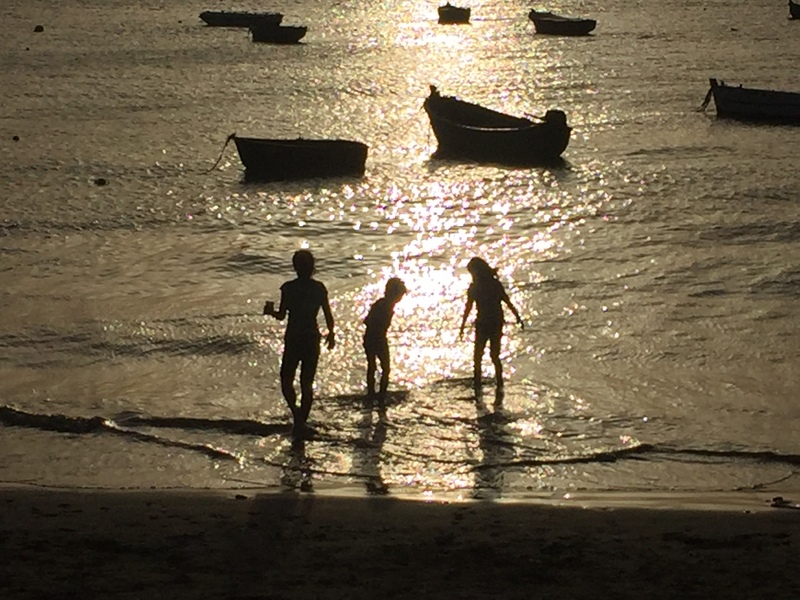 The second day I headed for La Bodeguilla de Cádiz, up towards the city’s northern beach. The locals are not surprised when a foreigner speaks Spanish, they seem to take it for granted. But when an American entered and spoke English the bar fell silent and everybody stared. It felt a bit like a cross between one of those spaghetti western saloons, and Royston Vasey. “A local bar, for local people”. The bodeguilla is a little away from the tourist centre (though nothing in Cádiz can be far) and it is a locals’ bar, recommended by a friend whose sister lives in Cádiz. When the American left without ordering, I wondered aloud if I should have translated for him. My new breakfast-mates protested vehemently, saying “No! We’re having breakfast together – you aren’t here to help foreigners.” Although I was just as much a foreigner as he, my foreign-ness was overlooked because we were speaking the same language. The third and final breakfast was late on Sunday morning. Francesca and Carlos had gone to Málaga to celebrate his birthday with his family, and the flat was mine. So I slept in, and enjoyed padding around and fantasising that it was mine. The morning sun behind the cathedral projected a perfect shadow of the spire onto the living room floor. Outside, the cathedral square was sunny but packed with Sunday tourists, so I breakfasted in a little hidden bar behind el Arco del Pópulo. A recently-widowed mum and her six sons and daughters at the next table were deciding who she would go and live with. The sons, just like the daughters, were keen to have her and care for her. She sharply reminded the boys that she wouldn’t be their cook. It was both sad and uplifting. This time I was happy to breakfast in silence and eavesdrop respectfully on a family planning the next phase of its life. The car gives me the freedom to wander and explore new corners of my adopted country. The language allows me to enter it and engage with it, rather than tread on its surface and view it as a tourist. I am a tourist, of course, on these escapadas, but I value hugely the conversations with strangers that offer me an insight into another culture. Plus, following the dining tips of various breakfast companions has led me to some exceptional bars! 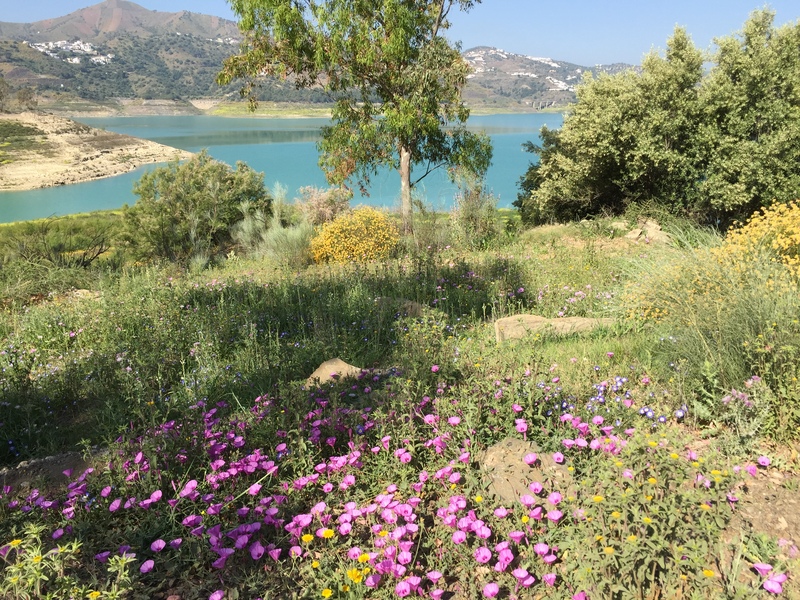 Back in my pueblo, I had signed up for a day out with the village oldies, a trip down to the reservoir and a gentle walk. 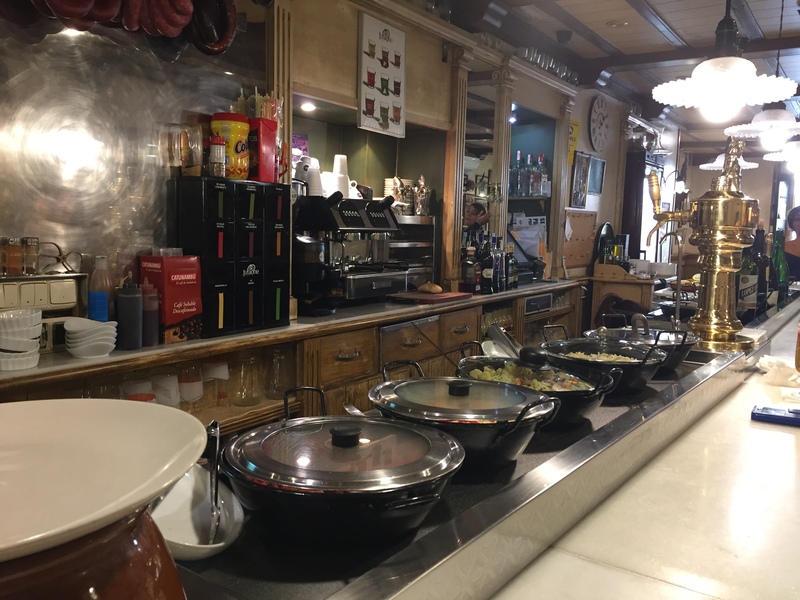 As the chartered bus rolled down Calle Camino de Málaga towards the excitedly-chattering group in the square, more bustled towards us from every direction, everyone carrying enormous cool-bags plus baskets laden with food. I wondered to my neighbour how it was going to work, if everyone brought enough food for six? She shot me a glance laden with ridicule. “There won’t be too much ….” she assured me. Piling off the bus at the edge of the Zona Recreativa we grabbed the bags from the luggage compartment and headed down the slope to grab a space at one of the big stone tables. It was only 10am but the first event on the agenda was “second breakfast”, an unshakeable Spanish tradition. 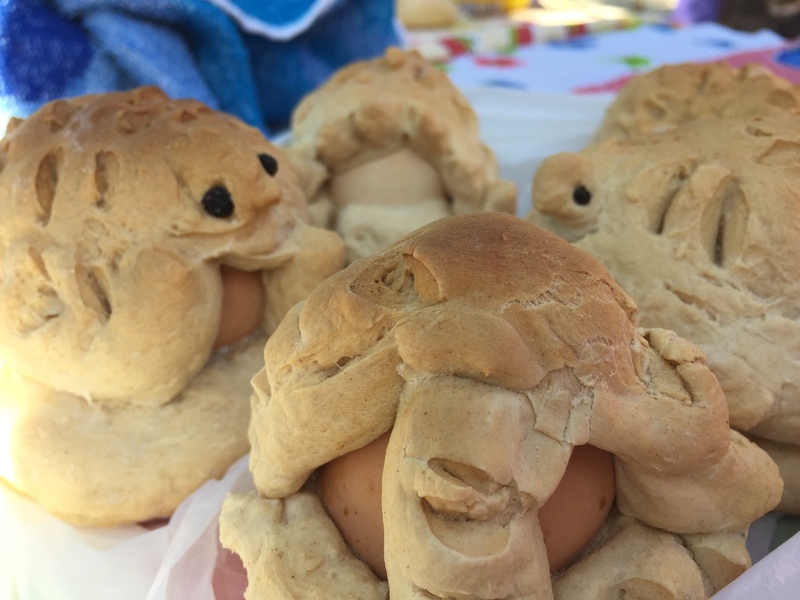 This being the Monday after Semana Santa (Easter week) Antonia’s table produced a selection of small “pavitos“, a baked item, a cross between bread and pastry, wrapped around a whole egg in its shell, and some “hornazos”, slightly bigger, and with eyes! What with breakfast and chatting and wandering between tables to see what people were eating, it was 11.30 before the long-suffering town hall organisers could get us on our feet for a walk around part of the reservoir. Juana and several others dived off the path a number of times, returning with handfuls of wild asparagus, that I could never see in the undergrowth – I think it’s in the Spanish genes! We returned an hour and a half later, and it was time for games. Moderately gentle, as this WAS a trip for the older residents, we split into two teams and played various ball games, throwing and passing big rubber balls. One of the games involved shouting the name of another person then throwing them the ball. Mildly problematic for me as my own neighbours had opted out of this exercise and I was surrounded by faces I vaguely recognised but which did not have names attached. My heart sank as I heard my name called and a second later the ball arrived at my chest. A brainwave struck, and I shouted “María!”. A safe guess, and at least five faces turned towards me. I picked one, gave her a look that was trying to say “Yes, you, María, I KNEW that was your name!” and I threw the ball. Every stone table had its own stone barbecue, and by now most had been lit, and the smell of wild rosemary and thyme wafted over towards us. A quick game of beach tennis (with some sort of scoop bats) and we stopped for lunch. Coolbags were opened, mountains of Tupperware appeared, even plates and proper cutlery. A Spanish picnic does not involve pre-made sandwiches eaten out of silver foil, goodness no. Bread is carved fresh from the loaf, huge salads decanted into big serving bowls, and decent glasses appeared from somewhere to be filled with decent wine. Bottles of excellent olive oil were carefully unwrapped (our table of five had three litres of olive oil between us), and meat spread out over the flaming wood. It was a veritable feast. 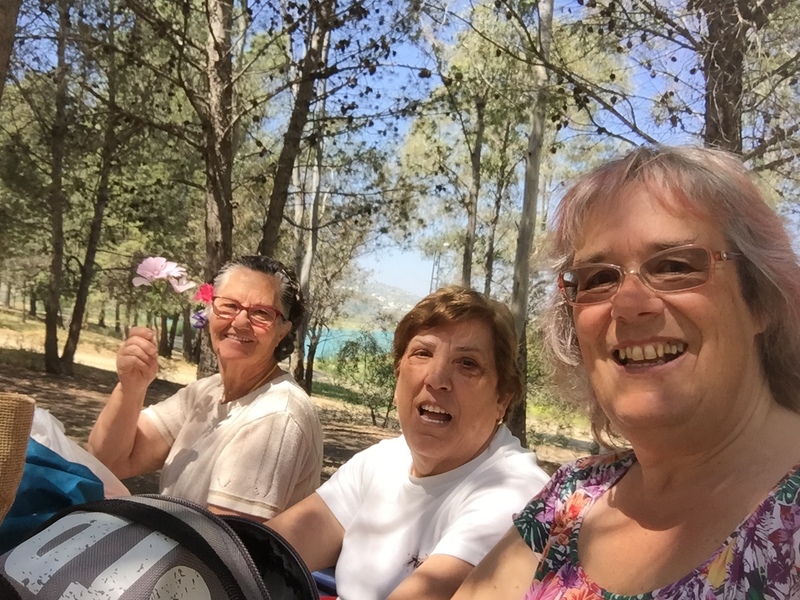 And sharing food, and laughing, and breaking bread, with good friends and neighbours in the beautiful surroundings of the natural woodland, beside the reservoir, was on the one hand nothing more than just another “día en el campo” (day in the countryside), and on the other hand it was so much more. PS: If you have some Spanish, it is worth listening to a monologue about a day in the countryside by the Malagueño comedian Dani Rovira. His affectionate and hysterical take on this ancient Spanish tradition is fast but very funny. This entry was posted in Spain and tagged Andalucia, breakfast, campo, Cádiz, Colmenar, Dani Rovira by tamaraessex. Bookmark the permalink. I like Dani Rovira in the Surnames films (Catalan and Basque), if you haven’t seen them, you should – they are hilarious.